Press Release: COSTA MESA, CA -- LendingQB, a provider of end-to-end loan origination software, announced that they completed a seamless interface with DocMagic's document production and compliance technology. 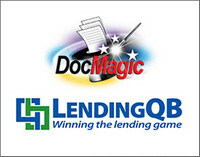 The integrated solution provides users working in LendingQB's loan origination system (LOS) with seamless access to DocMagic's document preparation functionality. The companies partnered to make the process of ordering, sending, signing and receiving compliant mortgage documents as effortless as possible. The new interface completely embeds DocMagic's functionality within LendingQB's LOS, preventing users from ever having to leave the environment in which they are accustomed to working in-LendingQB. All activities, from selecting document packages to auditing data, occurs in LendingQB's centralized database, eliminating the need to re-key information and potential loan data mismatches, thus ensuring accuracy and compliance with all state and federal regulations.